Max Rudolf Interview with Bruce Duffie . . . . . . 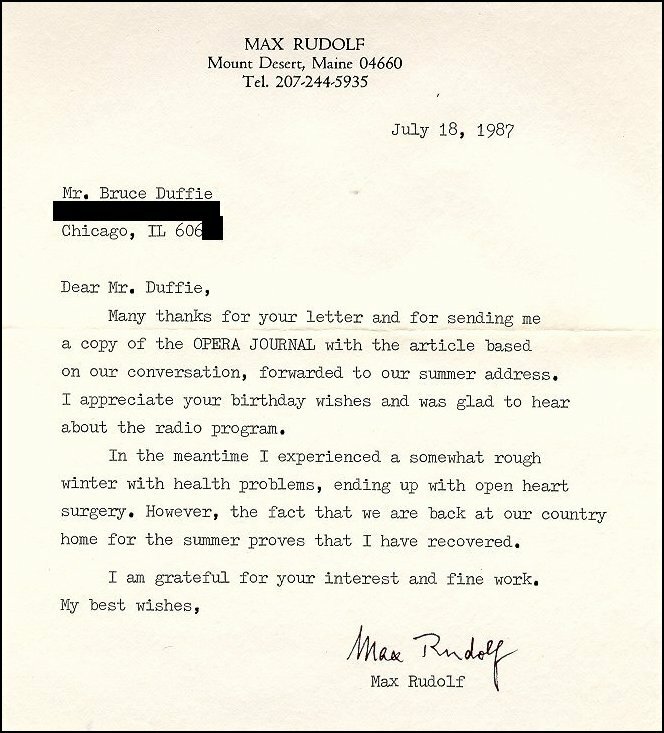 In mid-June 1987, Max Rudolf celebrates his eighty-fifth birthday. His career has encompassed successes as conductor and administrator of both opera and symphony. He is also a respected author of numerous articles and a basic standard text for conductors. Beyond all of this, he also found time to pass along his findings and accomplishments to students at the Curtis Institute of Music in Philadelphia. 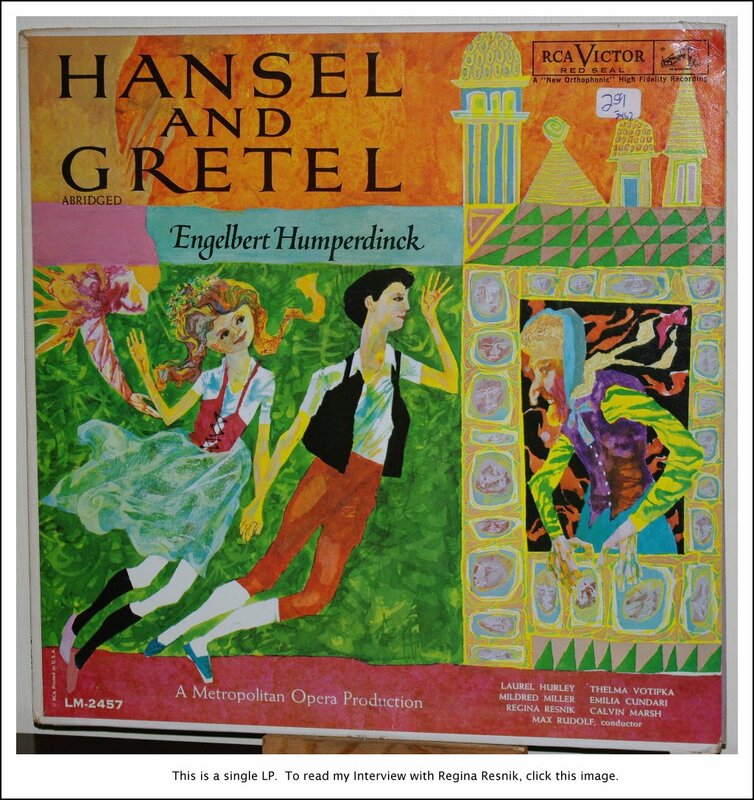 In addition to the myriad performances, Rudolf appears as conductor on several recordings, including complete sets of Hansel and Gretel and Madama Butterfly, excerpts from Medea and recitals with Eileen Farrell, a suite from Rosenkavalier and music of Johan Strauss, Jr., as well as the Ravel Piano Concerto in G with Wittgenstein (for whom it was written), and the Symphony #5 by Gene Gutchë. Max Rudolf: When I joined the Met, the first year I was an assistant conductor, and the second year they made me a full-fledged conductor and a member of the administration. I worked as an assistant to Frank St. Leger. He actually did the work for Edward Johnson [General Manager of the Metropolitan Opera 1935-1950]. Johnson was a figurehead and a politician. The society loved him and he knew how to make speeches. He was a hand-shaker and had good qualities, but not as a manager of an opera company. He relied on St. Leger, who made many enemies – which I felt was unfair because he was an extremely able man. I worked closely with him for four years and got to know him quite well and appreciated him. He also could judge voices well, and the results were there. I will say something now which is based on much thinking, and that is that Edward Johnson was the best judge of voices I ever met. I did not think very highly of his ability as a General Manager, but as a judge of voice, no one could match his ability. Not every singer can judge voices, but he really had the feeling for it. He could smell the talent. Think of all the American singers who made great careers during that time. St. Leger also would speak to the young singers and was quite good, too. He wasn’t a great conductor, but he was a fine musician and a very good coach. When people lament for the good old days, I think we can prove it on paper with the names. We took these casts for granted and didn’t think anything special about them. Rudolf Bing [General Manager of the Met 1950-1972] imported more from Europe, and actually went there every year as well as having a scout on the Met payroll who kept his eyes and ears open. Bruce Duffie: While you were at Curtis, what advice did you give your students? MR: The best advice I could think of at the time. That cannot be summed up in a few words. It was all individual, and what I told one singer I would not tell another. 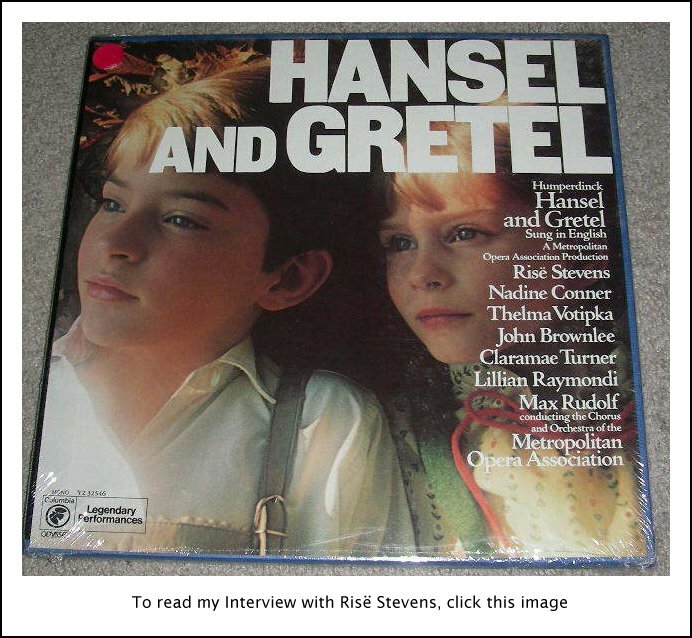 We were quite successful, but I stayed only three years – from 1970 to 1973 [photo at right]. I came back in 1983 but only to teach conducting. BD: Can conducting really be taught, or must it be learned by doing? BD: When you’re conducting, what is the balance between inspiration and technique? MR: Inspiration is more important; technique is useful. Koussevitzky didn’t have technique, but he was a great conductor. Usually operatic conductors have a better technique than those who never conducted opera. In opera there is never enough rehearsal time, and sometimes you take over without any rehearsal. You must be able to convey to the orchestra your ideas. Even when there is time, very few American conductors rehearse well. BD: Should music be “art” or should it be “entertainment”? MR: Let’s forget about opera because opera is entertaining due to the use of the visual effects and the impact of the dramatic story onstage. Much concert music is entertaining while still being masterworks. There is something like the emotional uplift which religious people feel in church. You leave the concert hall feeling like a better human being. I always tried to end the concert with a work that would send the public home with this feeling because it helps to make the public feel the nobler sides of their personality. Some composers had a certain magic to accomplish this. [Note: Several times throughout our conversation, Rudolf mentioned Wagner. He told me that he’d done only a few at the Met – Lohengrin, Tannhäuser and Tristan – but in Europe he’d done them all, even the Ring. For some strange reason, discussion of Wagner always brings up the question of cuts.] Making cuts depends on the circumstances. Nowadays, it’s a fad to open all the cuts. Even Verdi himself made some cuts when his works were done in Paris. Toscanini made cuts, too. BD: What about doing operas in translations? MR: Composers are generally in favor of it. Verdi always wanted his audiences to understand the words. Even in Europe now, the trend has changed and quite a few Italian operas are done in Italian in Germany and Paris. Once the public knows the opera well, it sounds better in the original, no doubt. The conductor must live with the words. I speak fluent French and German, but I didn’t like conducting operas in languages I didn’t speak. Fortunately, that happened very rarely. I did Boris Godunov in Europe a few times, but in translation. BD: Is the public becoming more sophisticated now? MR: I doubt it. I remember when I first went to Italy, the public knew the words of the operas backwards and forwards. They would mouth them with the singers. My barber would discuss with me the merits of a certain tenor and how he was hitting the high notes. In Germany they knew their Wagner well, and also Fidelio and some Mozart. BD: Do you feel opera works well on television? MR: I think so. I’ve seen some wonderful productions. The Salome with Stratas was great, but that was done in two parts – the music was recorded first, and then the stage director came in. The conductor was through once the music was on tape. 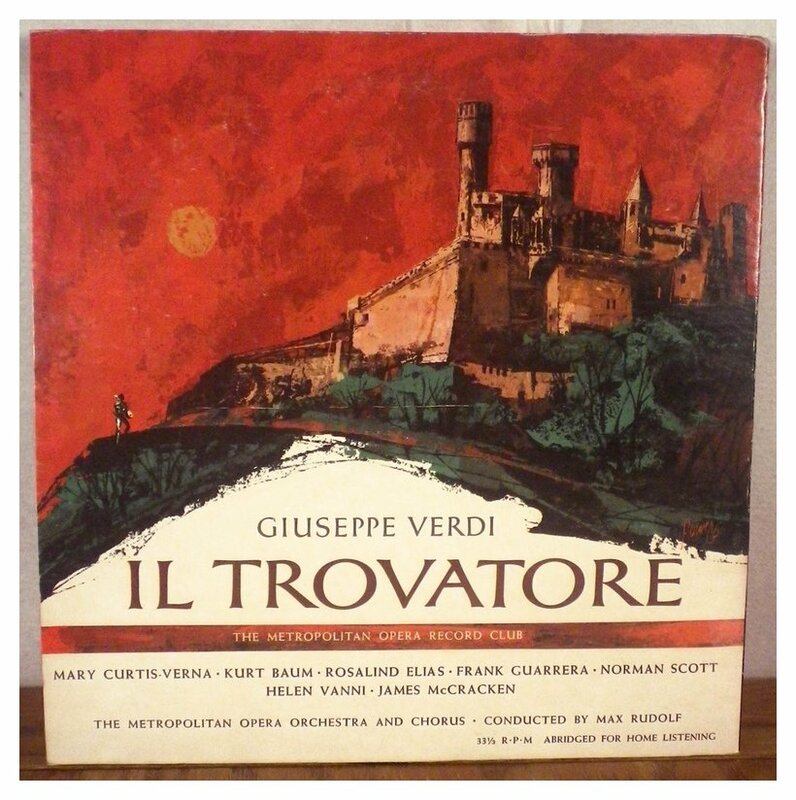 There was also a Cavalleria from Italy that I thought was excellent. BD: How can the opera houses be persuaded to do more different operas? MR: When we did the Rake’s Progress in 1953, the people just didn’t come. The subscribers stayed home. We couldn’t even play all the scheduled performances, so we changed the repertoire. We took Peter Grimes on tour in 1948, and it was a great success, so they asked for it again the following year. The second tour we played it to empty houses. This changed, and now has changed again – box office results in New York are not as good as some years ago. When I was with the Met, I studied very carefully the relation between works, casts, and ticket sales. It also depended on the day of the week. We could play Aïda on a Friday with a mediocre cast and it would sell out. It would also do well on Saturday, but especially Friday for some reason. There were other evenings that we had to be more careful with the casts. It sounds terribly mechanical, but since I was in charge of repertoire, I felt it was my duty to get the best possible box office results. We needed the income. BD: So economic considerations dictated artistic decisions? MR: If the artists had been available, we would have had only first-class casts, but in a long season the artists aren’t always in town. I think that during the Levine regime [James Levine, Music Director (and later Artistic Director) of the Met 1976-2004], some things have worked out very well. Jimmy is not always treated justly by the critics. My son who reads the Wall Street Journal sent me a clipping which said some bad things about him, and I think it was not justified. BD: What is the role of the critic? MR: Well, we are all critics – not just those who write. What changes the picture is that some make a living writing reviews. I think that when a critic sits down to write a review, he should remember that there’s a fifty-fifty chance that he’s wrong. When I am a judge of a competition – which I’ve done many times for conductors, violinists, pianists, singers – I always am very uncomfortable. The percentage of wrong judgments is very high. I don’t believe in the value of competition. You should look at the results after twenty or thirty years. The Met Auditions of the Air were quite successful, but they were in a more performing mood when they were on the air. It could have been good luck that the vintage was very good. Did you know that I conducted the very last audition of the air with the orchestra? That was in 1958, and the two winners were Martina Arroyo and Grace Bumbry. They were completely unknown until then. MR: Yes. These were quite successful. I know because I kept getting the royalties. My cut was minor, but still it was worthwhile. They wanted to give me a lump sum, but I said I wanted a cut, no matter how small. It was a pleasure to work with Eileen. She was so musical and so talented, but lazy. For a long time, she sang arias only over the air. Finally she tried her first staged-opera in Chicago and decided she liked it. [This was La Gioconda in 1957, with Tucker/DiStefano, Protti, Simionato, Wildermann, and Tallchief, conducted by Serafin. She would repeat this opera two seasons later, and also sing La Forza Del Destino in 1961.] So I told Bing that we should get her, and that’s how she came to us. 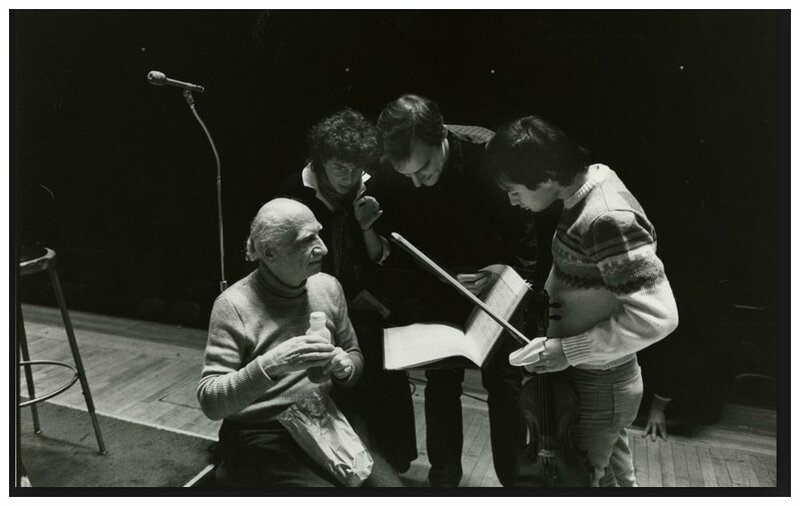 I liked the recordings we made, and Bruno Walter heard the Beethoven arias and said he liked them. BD: What about your other recordings? 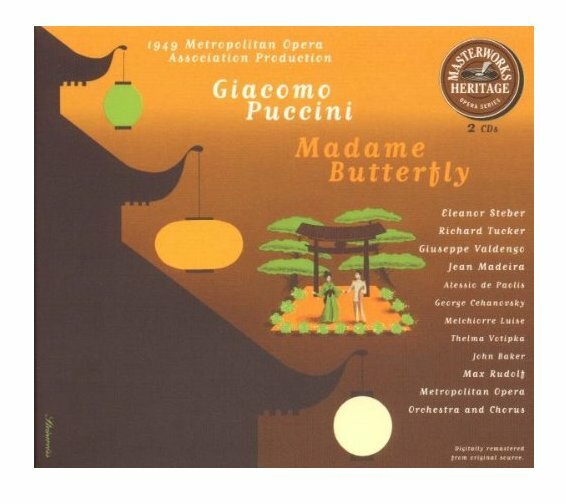 MR: I remember when I went to Italy in 1955 to conduct in Turin, several of the singers I was working with for the first time said they knew me from my recording of Madama Butterfly with Eleanor Steber. It had been selling well there. When you make an opera recording, it’s important to keep everything together and let the work flow. In my symphonic recordings, I always feel I could have done better, but this is a general observation among many conductors. I find some of the tapes of my live performances better than the recordings. As we wound up our chat, Mr. Rudolf mentioned that he doesn’t do much traveling any more, and conducts mostly Haydn, Mozart, and The Bartok Divertimento. He is still quite active with writing articles for the American Conductors Guild Journal (which he hopes are eagerly read). He mentioned his book, The Grammar of Conducting, and praised William Schuman for seeing to it that it was first published many years ago. 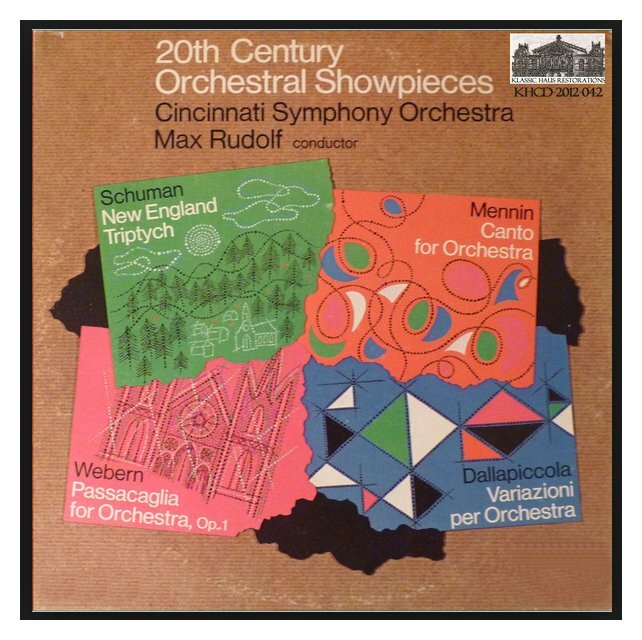 Schuman also praised Rudolf’s recording of the New England Triptych as the best one he knows. When this interview appeared in The Opera Journal, I sent him a copy, and not long after that I received this kind note from him . . . . .
Bruce Duffie is an announcer/producer with WNIB, Classical 97 in Chicago. In the next issue, the view from the prompter’s box with Jane Klaviter. See my Interview with Frank Guarrera. roles at the Met, such as here where he appears as both Ruiz and a Messinger. See my Inrerviews with Martial Singher, Giorgio Tozzi, and Herta Glaz. Note that this single-LP is narrated by Milton Cross, long-time announcer of the Saturday Afternoon Met Broadcasts. Max Rudolf, a conductor and teacher who played a big part in the training and guidance of two generations of American conductors, died on Tuesday at his home in Philadelphia. He was 92. Along with his colleagues Erich Leinsdorf, George Szell and Fritz Reiner, Mr. Rudolf brought a broad European education and sensibility to a New World environment. 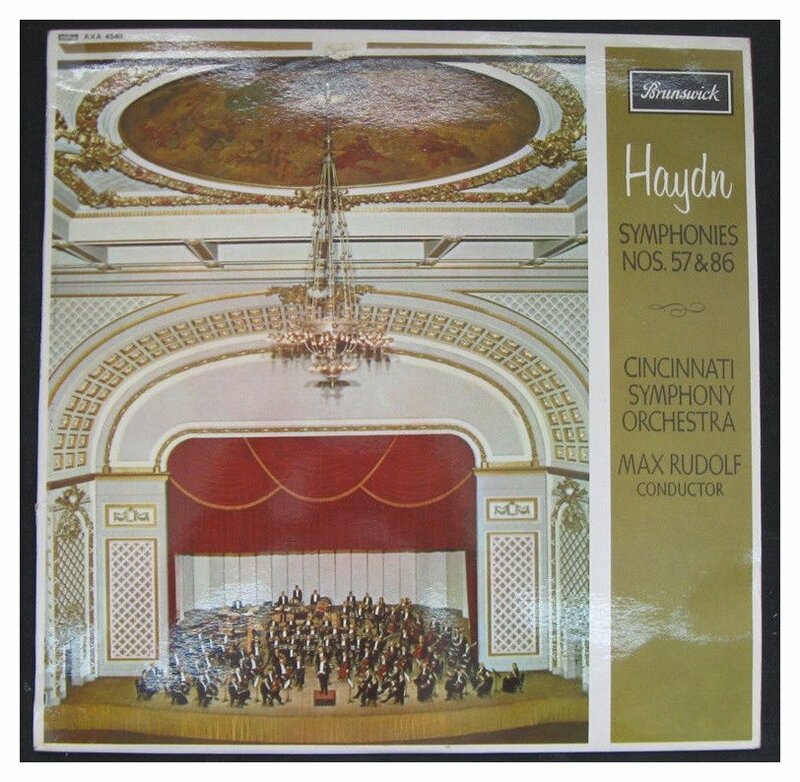 He was music director of the Cincinnati Symphony from 1958 until 1970. He recorded frequently and was a guest conductor with most of this country's major orchestras. At various times he advised the symphonies of Dallas, Detroit and New Jersey. 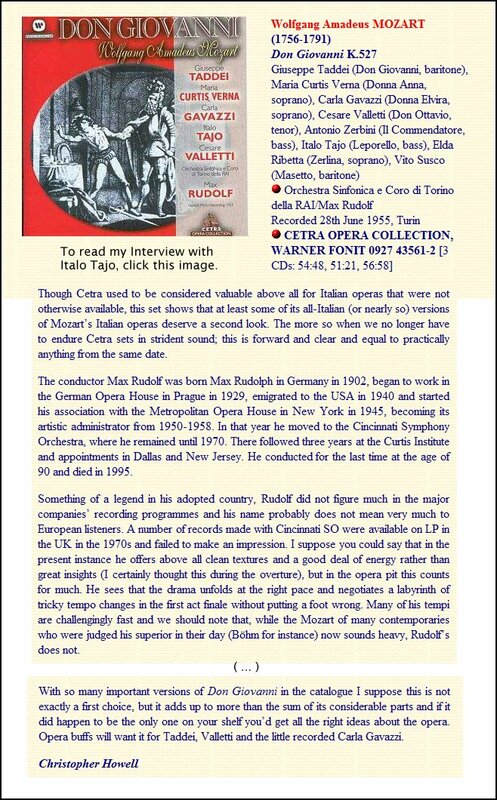 Opera was a specialty, especially the Mozart and bel canto repertory. But it is through his teaching -- and especially his long, if intermittent association with the Curtis Institute in Philadelphia -- that he will probably be best remembered. 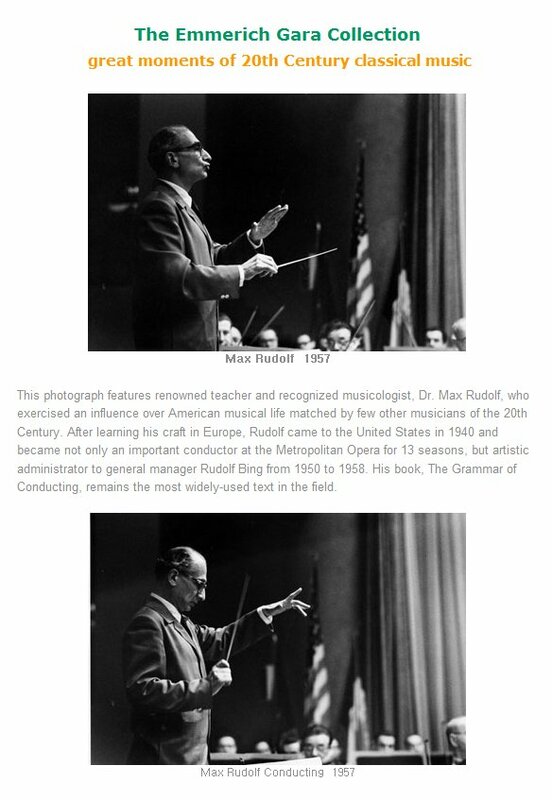 Mr. Rudolf headed the conducting and opera programs at Curtis from 1970 to 1973 and lived the rest of his life in an apartment opposite the school. He rejoined the faculty in 1983 and was an emeritus member until his death. His book "The Grammar of Conducting" has been an influential text since 1950, and many of his students have gone on to successful careers. One of the more notable was the late Calvin Simmons. Max Rudolf was born in Frankfurt am Main in 1902. He learned four instruments as a boy, and began composing at 12. From 1915 to 1922 he studied composition with Bernhard Sekles, the teacher of Paul Hindemith, but then gave up composing in order to conduct opera. This he did mostly in Darmstadt before leaving Germany in 1929. 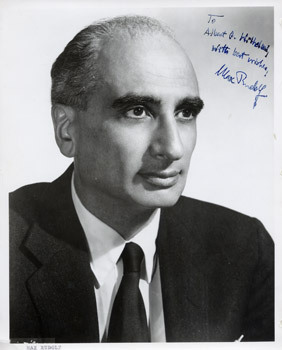 For the next six years Mr. Rudolf was the associate of George Szell, then the music director of the German Opera in Prague. For five subsequent years he conducted opera and various orchestras and choruses in Gothenburg, Sweden. He moved to the United States in 1940, worked in relative obscurity in Chicago for two years and then came to New York, where Edward Johnson invited him to join the staff of the Metropolitan Opera. Named the house's musical administrator by Rudolf Bing in 1950, Mr. Rudolf was Mr. Bing's close adviser for the next eight years. He became an American citizen in 1945. 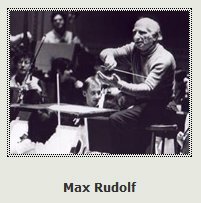 Mr. Rudolf was a major influence in the successful Exxon Affiliate Artists programs establishing apprenticeships for young conductors at major orchestras. He said he owed his own abilities not to any school or conservatory but to the old network of small German and Austrian opera houses at which beginners learned by doing. 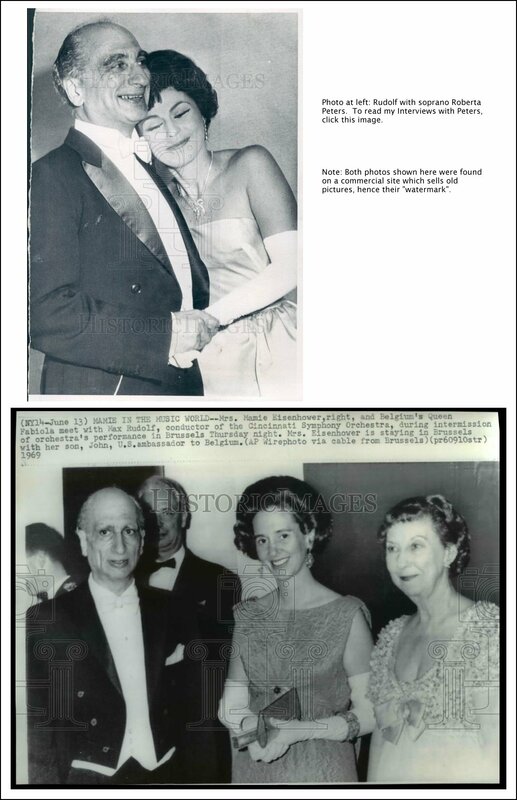 For his efforts, the National Conference of Conductors gave Mr. Rudolf its first Theodore Thomas Award in 1988. In retirement, Mr. Rudolf counseled his old pupils, many in high positions, read widely and corresponded with musicians and musicologists. He contributed articles and letters to many publications, and relished a good argument over stylistic correctness or points of fact. He is survived by his wife, Liese; a son, William; a daughter, Marianne; six grandchildren, and six great-grandchildren. This interview was recorded on the telephone on January 21, 1987. Portions were used (along with recordings) on WNIB later that year and again in 1997. The transcription was made and published in The Opera Journal in June of 1987, and has been slightly edited for this website posting in 2009. More photos and links were added in 2016.